I reported last night at Search Engine Land that Google Sent Over 700,000 Messages Via Webmaster Tools In Past Two Months. 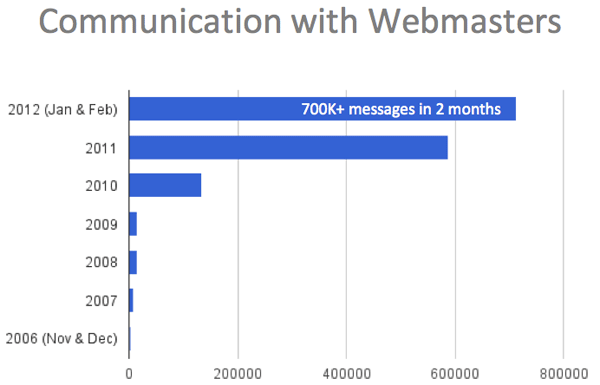 At SMX West during the Ask The Search Engines, which I did not live blog, Tiffany Oberoi from Google shared a slide that showed in the past two months Google has sent over 700,000 messages via Google Webmaster Tools message center to individual webmasters. Prior to that, they sent maybe a total of a million since launching Google Webmaster Tools in late 2006. At this rate they are likely to reach well over 4 million individual messages to webmasters. Google told us this number includes both manual and automated messages but does not include messages such as malware notifications, responses to generic reconsideration requests, or generic responses to the more feedback form. You have no idea how happy this makes me. I've been covering the relationshop between Google and webmasters for about ten years now and to see this, it makes me happy. Plus they are asking for more ideas.